If you want to try something different, consider heading to one of the oyster bars right here in Omaha, Nebraska. There are more in the city than you may imagine, with additional options if you are willing to drive a bit. Most of the oyster bars also have other items on offer if you want to supplement your oysters with other seafood or someone in your group simply doesn’t like oysters. Here are some of the spots to check out. Omaha is actually home to several different locations of Shucks Fish House & Oyster Bar, letting you choose whichever is most convenient for you. It has been voted as having the best seafood in the city. This local business offers Downtown, Legacy, and Pacific Street locations. Shucks gives off the feeling of an old-fashioned oyster bar and has delicious choices like oysters on a half shell that are shucked before your eyes; po boys with shrimp or oysters; and fried shrimp, oysters, calamari, and clam strips. For those who want something else, consider a salad, clam chowder, gumbo, or crab cakes. Don’t forget to check the weekly specials so you can look forward to some fresh fish. If you want to save some money, visit between 2 and 6 p.m. to take advantage of Happy Hour. There are specials on drinks, as well as oysters on the half shell for just 99 cents. There is also a gluten-free menu, making this a great choice for celiacs. At Le Bouillon, you can enjoy the oyster bar or try some delicious French food. 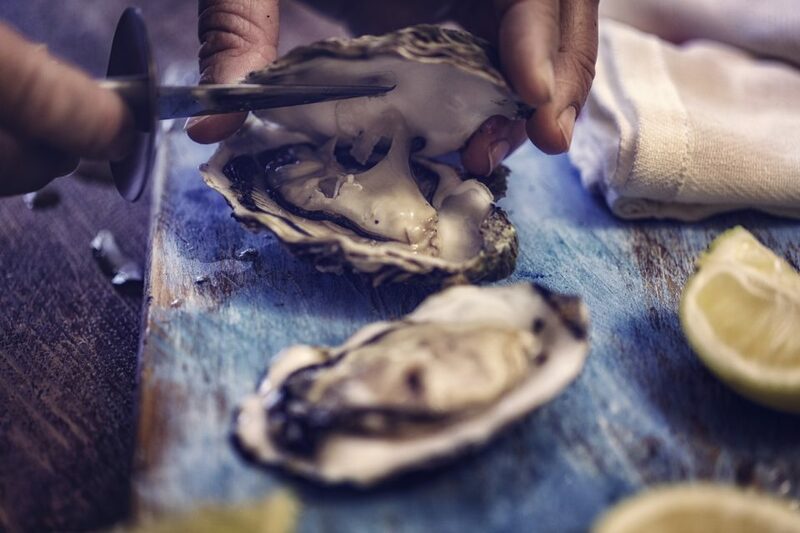 The oysters are daily selections from the East and West coasts and are just six for $15 or 12 for $30. Seafood lovers will also want to consider the marinated shrimp cocktail. Otherwise, you can have French dishes like charcuterie, toasts, soups, salad, sandwiches, escargot, market fish, and local farm chicken. Plank Seafood Provisions has a varied menu with fresh fish served every single day. The oyster bar has six different options, or you can walk the plank to try them all for a special price. You can also get dishes like potato-crusted calamari, chowder fries, peel ‘n eat shrimp, and crispy alligator to start. There are plenty of soups and salads, as well as fresh fish like tilapia, Mahi Mahi tacos, Scottish salmon, albacore, and more. You will find choices for the kids, as well, from fried shrimp or catfish to chicken strips and cheeseburgers. To save money, get a lunch special or dine during Happy Hour, when you can get oysters for just $1.25 and lower prices on other items. No matter which oyster bar in Omaha, Nebraska, you plan on dining at, a vehicle from O’Daniel Honda can take you there.